S'thabile Mlotshwa is a creator, art collector and passionate campaigner for women’s rights who sees art as a catalyst for change, innovation and human advancement. She is Founder and Executive director of Thamgidi Foundation (which includes a Fund, Artists in residency, artist Achieve, IFAA and all its branches, Art &Young People, Green is Cool and a Major Contemporary Art Collection). She is Producer of Art, Books en Wine, Artistic Director Festival De Oase, (a diversity performing arts festival bringing more than a 100.000 visitors per week) Producer and Artistic director of IFAA 2008, IFAA Art Platform and Network, Head of IFAA Global, (the International Branch of IFAA that facilitates cross-cultural cooperation) and includes: IFAA City, IFAA Regional and IfaaContemporary with (a gallery representing Visual arts & Design). Sithabile is also a Visual artist, independent Curator, Trainer and advisor for starting and managing independent cultural centers. She is former chair of "VAAB" the visual arts association of Bulawayo in Zimbabwe, former Secretary General ResArtis, Board of Directors WHAA Foundation, 2009 advisory Board member of the Gelders Balkon (Museum of Modern Art in Arnhem) and 2008 President of the Jury at the Dakart Biennale. Seven of her major achievements include: 1) The Thamgidi Fund, that has to-date given more than 40 grants. 2) The Thamgidi Foundation Artist in Residency Center with a Guest Studio, apartment and library receiving creators of all disciplines from across the globe. 3) Building a major collection of contemporary art with the focus on Africa and the international Diaspora. 4) Producing IFAA 2008, IFAA Art Platform, IFAA Network and IfaaContemporary. 4) Developing IFAA Global, 5) Producer Art, Books en Wine (a network and debate platform bringing together creators and the corporate sector) through art, food, literature and wine. 6) Partnership with Festival d’Avignon 2013 & Society Mutotu for Kiripi Katembo’s exhibition and Catalogue publication. 7) Producer IFAA Network with more than 5000 members and 70.000 subscribers. Sithabile was invited to speak at Tedx Women Amsterdam and publicized in The Next Women (an Online Magazine For Female Business Heroes) as an inspirational woman. She is publicized in the Rebelle Art & Feminism 1969 -2009 catalogue of the Museum of Modern Art in Arnhem. 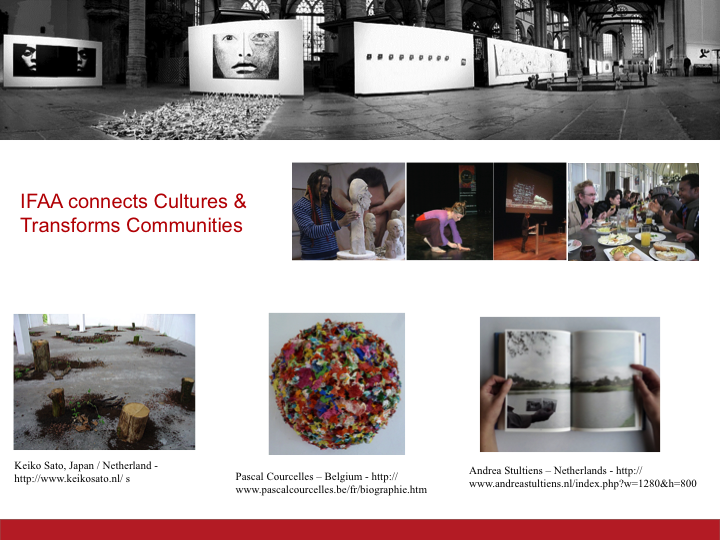 She was selected for the Asia-Europe Network Training Program of Independent Autonomous Art Centers in Paris organized by Asia Europe Foundation, Trans Europe Halles & Artfactories where she represented the Netherlands for the building of the Asia - Europe Network for Independent Cultural Centers. She has illustrated books and participated in the restoration of the Cyrene Mission (restoration of a church which is on UNESCO world heritage list).